Humorous vignette of a baby being pulled by a tiny little Dachshund. From the look on the babys face, somebody is not having a good day. 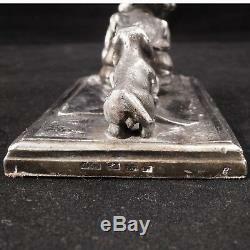 The heavy silver plate molding is of a baby who is in the crawling stage on a carpet with a small Dachshund pulling the baby. The piece is very well molded and fairly realistic. Even the carpet shows movement down to the end that the baby is holding on to. His face shows so much emotion. He is definitely not happy. I thought there was a damage mark on the back of the baby when I realized it was his nightshirt tearing. The piece has a leather-like covering to the base to protect the furniture. 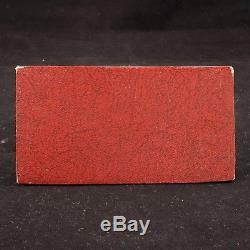 It could be a plastic, leather or textured paper rectangular covering. 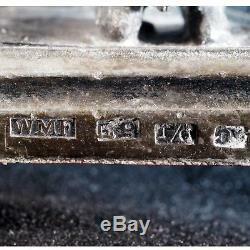 On the back edge by the dog there is a series of silver hallmarks, WMF, EP, I/O, OX and a g.
WMF is the abbreviation for Württembergische Metallwarenfabrik, or the Württemberg Metal Factory in English. The factory was started in 1880 in the small town of Geislingen on the river Steige (Geislingen an der Steige), after the successful merger of two smaller silver plate foundries. This company is still active nowadays; however the hallmark stamped on this piece was one of the earliest WMF marks, used from 1880 until around 1918. The additional marks: "EP" means "electro-plated" and "I/O" means normal silver coating, which is equivalent to 1 gram of silver per 1 dm2 of base metal surface. 4 long x 2 1/8 wide x 1 7/8 tall. There are no breaks, dents, or cracks. There are a few small nicks on the edges. This little work of art will bring a smile to your face. We just ask that you notify us before returning and obtain our authorization. This will ensure quick processing. 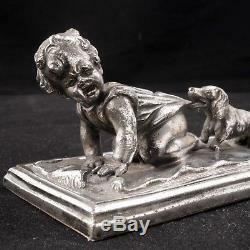 The item "German silver plate paperweight of a child being pulled by a Dachshund Ca 1880" is in sale since Friday, June 22, 2018. This item is in the category "Antiques\Decorative Arts\Metalware". The seller is "bearandraven" and is located in Ferndale, Washington. This item can be shipped worldwide.